With Black Friday and Cyber Monday quickly approaching, shoppers are already browsing the Internet for quality products at drastically lowered prices. 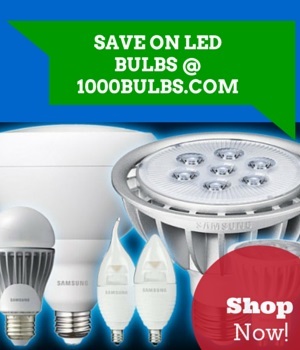 Internet lighting retailer 1000Bulbs.com will be offering light bulbs, automotive headlights, Christmas decorations, and more at discounted prices starting on Tuesday, November 26, 2013. All deals will be extending through Cyber Monday, December 2, 2013. For shoppers looking to find high-quality lighting for a fraction of the original cost, 1000Bulbs.com is having Black Friday and Cyber Monday specials on a selection of LED and halogen light bulbs. For the price of $4.49, 1000Bulbs.com will be selling the ETi Foreva A19 LED bulb which uses 8.5 watts, the equivalent of a 50 watt incandescent bulb to produce warm white light. Additionally, the ETi 5-watt A19 LED bulb will be on sale for $2.99. With a light output that matches 60-watt and 40-watt incandescent bulbs, the energy-saving ETi LED light bulbs are ideal for residential lighting applications such as table and desk lamps. The standard A19 shape of the ETi LED bulbs allow them to easily replace incandescent bulbs currently in household fixtures, saving customers money on their electric bills with their lower wattage consumption and impressive lifespan of 30,000 hours. In time for Christmas, prices on select holiday lights and decorations have also been lowered. Starting at $6.90 each, these safe Flameless LED Wax Pillar Candles can be bought for 25 percent off their original price using the coupon code "CANDLE25". For customers wanting to light commercial spaces, a selection of Philips PAR20 and PAR30 halogen bulbs will be discounted as well. Originally $2.99, the Philips 50-watt PAR20 halogen spot light will be available for $1.99. With a rating of 3,000 life hours, this long-lasting halogen bulb is ideal for a number of applications, including office, retail, and display lighting. Just in time for Christmas, prices on select holiday lights and decorations have also been lowered. Among the holiday decorations on sale are flameless LED wax pillar candles. Sold in a variety of sizes, shapes, and styles, the soft, glowing flicker flame of these candles will create a cozy, relaxing atmosphere. Starting at just $6.90 each, these safe, flameless candles can be bought for 25 percent off their original price using the coupon code “CANDLE25”. To keep these battery-powered LED candles lit, Rayovac AA batteries can also be purchased for only 25 cents each. Feel free to leave a comment or reach out to us on Facebook, Twitter, or Google Plus! Nov 22 How Many Christmas Lights for Christmas Trees?